eBay Error Code 21919489: Description contains HTTP resources, which are not secure. ShortMessage:Description contains HTTP resources, which are not secure. 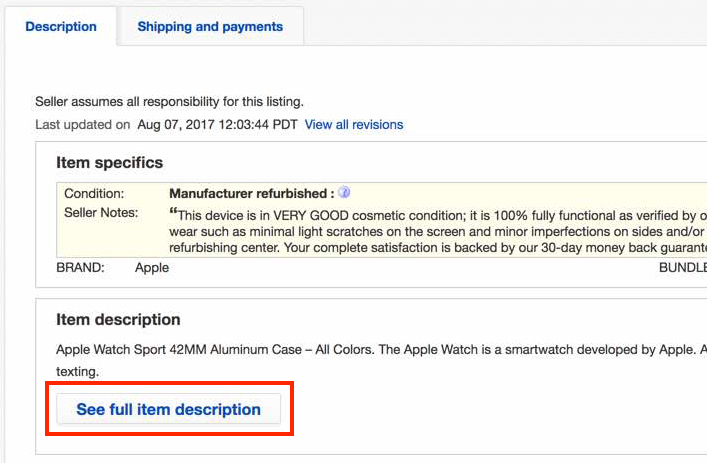 Back in October 2017 eBay have implemented new browser security standards, which introduced quite a few new requirements and regulate the use of active content, CSS, HTML and external links, videos and secure images and any listings, which do not meet the requirements would be flagged for HTTP issues and the product description would be displayed after an additional See full item description button is clicked. eBay offer a tool to check the listing's security and there are also other external tools, which can be used either to inspect single listings or all active listings and you can take a look at the two eBay links below and you would be able to see further and more detailed information about the requirements.